Welcome to conversations that explore what we can learn from abroad. The Foundation invites you to get inspired about how to build a Culture of Health in the United States. EPISODE 4: How Can Data Help Build Community Leaders? After traveling the globe, Abby C. King, PhD, professor of health research and policy, Stanford Prevention Research Center and Steven Sumner, MD, medical epidemiologist in the division of violence prevention, Centers for Disease Control and Prevention (CDC), discuss what we can learn from other countries about using data to help community leaders improve health and well-being, and share stories of successful data collection and community engagement programs from abroad that are now being used in U.S. communities. Webinar Recording: How Can Data Help Build Community Leaders? Steven Sumner, MD, of the CDC; Abby King, PhD, of the Stanford Prevention Research Center; and RWJF Director Karabi Acharya, ScD, discussed what we can learn from other countries about using data to help community leaders improve health and well-being. After traveling the globe, Shin-pei Tsay of Gehl Institute and Stephanie Gidigbi of NRDC discuss what we can learn from other countries about making public spaces more welcoming to all, and share a new approach for how to cultivate public spaces that are inclusive and support well-being. Gehl Institute’s Shin-pei Tsay, NRDC’s Stephanie Gidigbi and RWJF Director Karabi Acharya discussed what we can learn from other countries about cultivating public spaces that improve health, trust and social cohesion. Hear from Angela Venza of International Youth Foundation, Lashon Amado from Opportunity Youth United and Melissa Sawyer of the Youth Empowerment Project in New Orleans about how Latin America connects young adults to jobs and education--and what we can learn from those efforts to help put our youth on a path to healthy and successful lives. Listen to International Youth Foundation’s Angela Venza, Opportunity Youth United’s Lashon Amado, Youth Empowerment Project’s Melissa Sawyer and RWJF Director Karabi Acharya discussed promising ideas from Latin America that can be adapted to expand opportunities for youth in the United States. Listen to Krishna Udayakumar, MD, executive director of Innovations in Healthcare and head of Global Innovation for Duke Health and Corey Siegel, MD, director of the Inflammatory Bowel Disease Center at the Dartmouth Hitchcock Medical Center and co-chair of IBD Qorus as they discuss what we can learn from abroad as we work to transform health care, and hear how U.S. doctors and patients—inspired by efforts in Sweden—are working together to co-produce care. Dartmouth's Corey Siegel, Duke University’s Krishna Udayakumar and RWJF Director Karabi Acharya discussed promising ideas from overseas that can be adapted to improve patient care here in the United States. 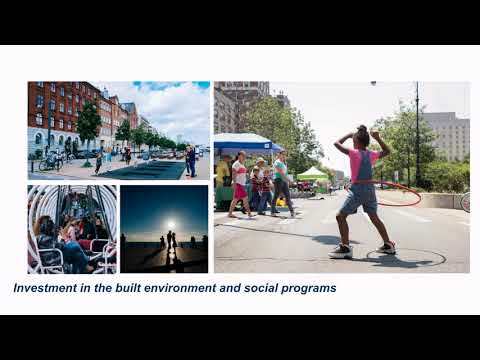 Learn more: How a Swedish Model of Care is Making an Impact in the U.S.
Inclusive public spaces for all are a central part of healthy, resilient communities. A framework can help planners ensure that processes for shaping these spaces lead to design decisions that promote equity.